How to make a good Questionnaire! "What do I hope to learn from asking the questions?" This defines your objectives: what you want to achieve by the end of the survey. Example: you want to clean up the local river. You feel that with some help and some money you could make it really beautiful again. Are other people also worried about the river. Are they willing to donate their time or money to help. Now you know why you are doing a survey, start writing down the questions you will ask! Just write down any questions you think may be useful. Don't worry about quality at this stage, we will improve your list of questions later. Do you ever go down to the river? Can you spare some money to help the river? Have you noticed the pollution in the river? Are you happy to volunteer for river cleanup? How should we clean up the river? You can also ask the person about themselves (not too personal! ), such as age group, male or female, etc, so that you know the kind of people that you have been surveying. Your Turn: Go ahead and write down the questions for your own survey! Closed-ended: With a choice of only 12 colors your work is easier, but they may not be able to pick their exact favorite color. You can present this data in a neat bar graph. I will ask people their general feelings about the environment before I ask them their feelings about the river. Your questions should also be neutral ... allowing the person to think their own thoughts about the question. The question "Do you love nature?" (in the example above) is a bad question as it almost forces the person to say "Yes, of course." Example: "How important is the natural environment to you?" Make sure each question is neutral. What are the possible answers to this question? Make sure you have most of the common answer available. If you are not sure what people might answer, you could always try a small open ended survey (maybe ask your friends or people in the street) to find common answers. Trick: try to avoid neutral answers (such as "don't care") because people may choose them so they don't have to think about the answer! It is also helpful to have an “other” category in case none of the choices are satisfactory for the person answering the question. Example: What is your favorite color? Sometimes you could have a scale on which they can rate their feelings about the question. For this type of answer the person gets to rate or rank each option. Don't have too many items though, as that makes it too hard to answer. Example: Please rank the following activities from 1 to 5, putting 1 next to your favorite through to 5 for your least favorite. Example: "How many times did you visit the river during the past year?" Look at each "closed-end" question and choose the best answer options. How Will I Gather the Answers? It is important to make the process simple, for both yourself and those responding. 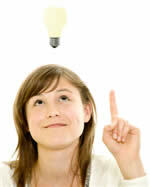 You will want a neat form that makes it easy to answer the questions AND easy to total up the answers later on. Type your questions and answer options into a word processor or spreadsheet, and format it neatly. Remember to leave plenty of space for open-ended questions. How Will I Show the Results? or just explained in words. Make sure each question is set up so you can present the answers in your chosen style. Example: you decide to have six options for "How many times do you visit the river" so the bar graph looks best. The Data Graphs (Bar, Line, Dot, Pie) tool can help. You should test your questionnaire on a few people. was each question clear and easy to understand? were they happy with the options? It is also a good idea to time how long it takes so you can tell people "this survey only takes __ minutes" (put in your time). Use the Stopwatch. Try the questionnaire on some friends. 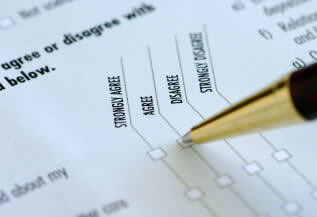 Take notes of any difficulties your friends have with the questionnaire, and see what you can do to improve it. will the questions really help you find out what you want to know? This is your last chance to make sure your questionnaire is a good one! ... go out and ask them!